The Winter Garden, by Kara Jorgensen, is book Two of the Ingenious Mechanical Devices series. It is not necessary to read the first book in the series before enjoying this novel. 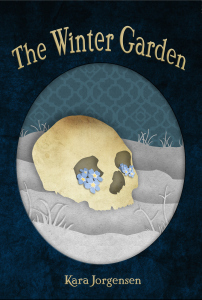 The Winter Garden is a neo-Victorian style novel. Immanuel Winter, a student at Oxford, rescues a young woman, Emmeline Jardine, after she drowns in the Thames by the use of a magical elixir that links their souls. Emmeline and her mother are members of the Oxford Spiritualist Society. One of the spiritualists, Alastair Rose, desires the secret of this elixir at any cost. He knows that the elixir will allow him dominion over the dead and the living.